It is raining. And it was so muggy, it’s a good thing. My daughter took me to lunch. 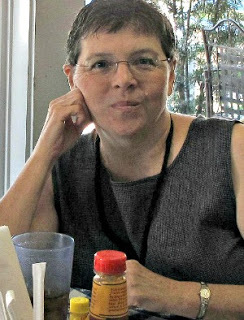 I had some bank papers I’d signed to give to her, in case something should happen to me and I was not able to pay the bills. You know, the kind of stuff you have to think about when you’re around our age. I tell you what. This is the best year I’ve ever had for cone flowers. And I’ve had them in the ground and they never did this well. They seem to love being squished up against other plants in this pot. Everything is just growing, growing, growing. Some plants have piddled out in the heat. So I cut them way back and they may get their second wind when the temps cool down in the fall. I just now took a photo of these right outside my front door. They grow along the side by the fence and over the roof. I can’t for the life of me think what they’re called? Anybody? And of course you really can’t go wrong with Purslane in the heat of summer. 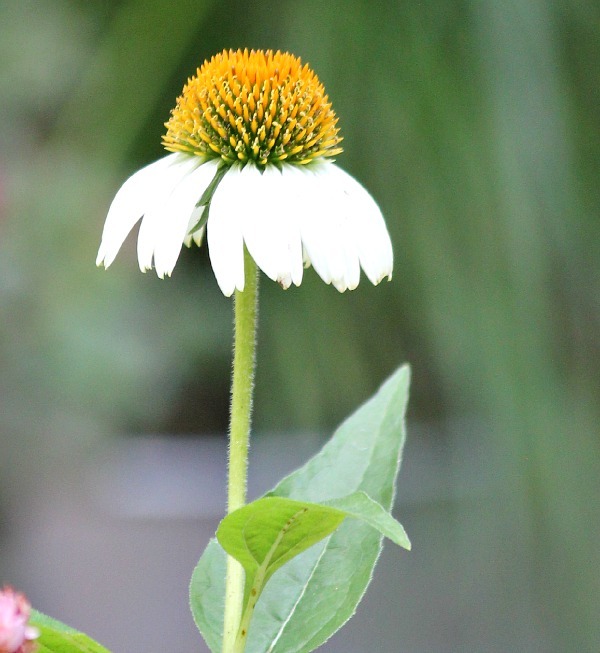 The white cone flower I moved out of the ground space by the fence and into a pot near the salmon colored one has started perking up for me. Move those suckers around when they’re not performing well. That’s what’s so wonderful about gardening in containers! I love the textured look of the driftwood as a back drop to the flowers and herbs. So what’s your gardening update this week? As I am trying to conserve a ton of water per month so I am not fined (or my landlord is not fined), I am trying realy hard to keep the grass semi green. My little town is so ugly and brown. About 75% of people no longer water their lawns because of the tight water restrictions. Per household, only 25 units are allowed, anything over that is a 25.00 fine per UNIT used. Being single and constantly watching what I do with water I have averaged 22-24 units a month. So I cannot imagine a family of 4 being able to keep it at 25 units a month even without watering their lawn. Now, for my flowers, my cosmos and zinnias are doing remarkably well. My impatients are doing great in the shade. I had to pull all my petunias. They just got gross looking. I am going to plant more cosmo and zinnia seeds this month fo rfall. Everything in your neck of the woods looks so lush and beautiful. I have rain envy. It is just so dry and hot and brown here. Your garden looks so beautiful! I love the cone flowers. Today the sun was shining, and i was so happy! A few hours later it started to rain again. Have a sunshine day!! Your plants look so great. I think that patio is better than a yard. Perfect size. Lots of sun. Lots of birds. What more could anyone want. Brenda, your flowers are all beautiful! Very pretty containers. 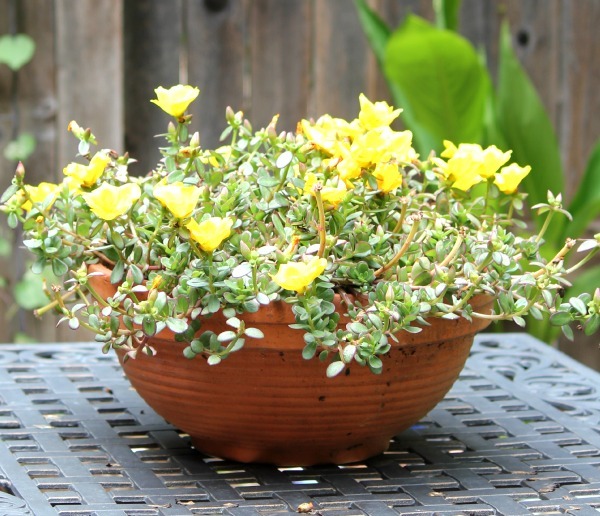 I am trying to master succulents, but I have far better luck with my landscape plants. I trimmed back the lantana and selvia near the front door – thy are going gangbusters. I have to do just a smallish section at a time due to the muggy heat. The lariope is blooming and loves all of the heat and rain we've had. Tomorrow, I'll trim the lantana by the sidewalk. It blooms bright yellow and butterflies are EVERYWHERE. Your plants are beautiful ! I cannot keep any long, if its not the heat its the storms! count your blessings! We are in a drought and we are having to rip out dead stuff that just can't survive and wait to see if others will come through. Well, there is always bark and walkways to build! Your garden is doing so well!! 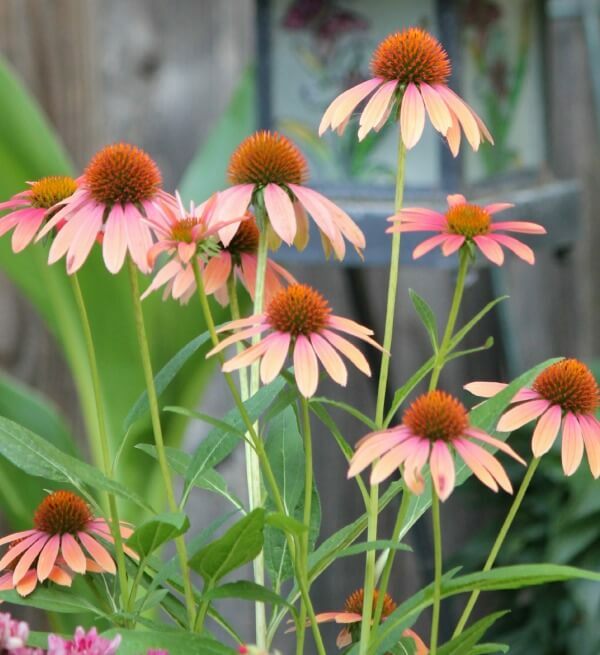 I love cone flowers and may try some next year. My flowers are doing well since we've had some rain, but then the heat is back and wilts everything! Oh well. You are so good at photographing flowers! I wish I knew how to do it! I use a zoom lens. Then I take the pics to Picmonkey and crop. And crop. As long as I don't crop below 600 px., which is what size pics I use on the blog. I think the trick, if there is one, is using a zoom lens and cropping. Sometimes I Sharpen on Picmonkey as well. Everything looks beautiful! 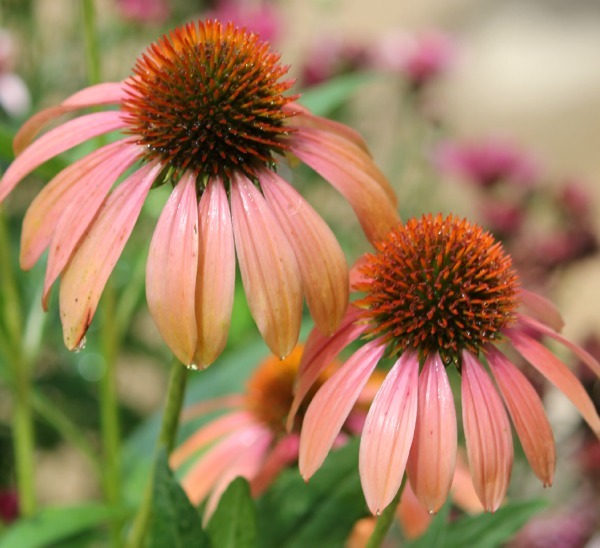 Love those coneflowers! Your garden is beautiful. The flowering vine growing outside your front door looks like a trumpet vine. I have one too. 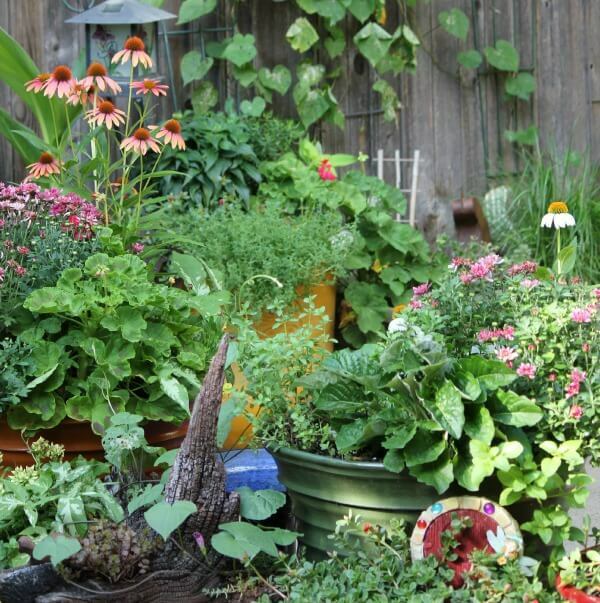 Lovely garden photos Brenda, is the plant you are unsure of with the orange flowers a vine? If so it is a orange trumpet vine. I have one in my garden. Its was hot and humid and today it's in the low 70's. Coolest season I can remember, but it's OK cause I love cooler summers! Yes, it's a vine. And that's what I thought it was. Oh your garden is so beautiful. I wish I was there to enjoy it with you! I had a dilema. Realized my caladiums were getting too much sun. Duh. I just never thought about it. I moved them on Sun. and they are looking better. It's been so long since I've gotten to have plants I forgot what to do with them. Thanks for sharing your beauty's. Have a great week. XXOO. Yes, caladiums can't take much sun in my experience. So pretty. My flowers are starting to be more and more difficult to keep alive in the Texas heat. I am not giving them enough attention, I'm afraid. I do have a patch of zinnias that are bursting with color. I'm thankful that I added them, because I'd probably be bummed with what I have left. Trumpet vine (Campsis radicans) Hummingbirds love them! Your flowers look great! My daylilies look great, so do my white cone flowers, yellow cone flowers, salvia and my shrubs. I have had tons of rain, over 8.5 inches in two days last week…..2 inches last night, and more coming! I wish I could send it out west! Everything is so gorgeous Brenda! I have not been able to plant anything this year — we have been on the road too much and I knew it would all die without some care while we were away! The trumpet vine you have growing is one of the prettiest I've seen! Brenda your gardens look so beautiful and your photos are stunning!! Wellll, we just don't have much in bloom around here right now. My bushes mostly bloom in the springtime, and I do have a few flowers in pots on the back deck, some of which have not taken well to the extreme summer temps we have had this year. Guess I will have to wait for autumn for more colors in the yard. With the heatwave we had, I thought for sure I was going to lose almost everything, but luckily when the monsoon season kicked in some rain and the heatwave went away, everything seems to be saved. It looks beautiful! Are the red one's a trumpet vine? It looks like one from the picture. 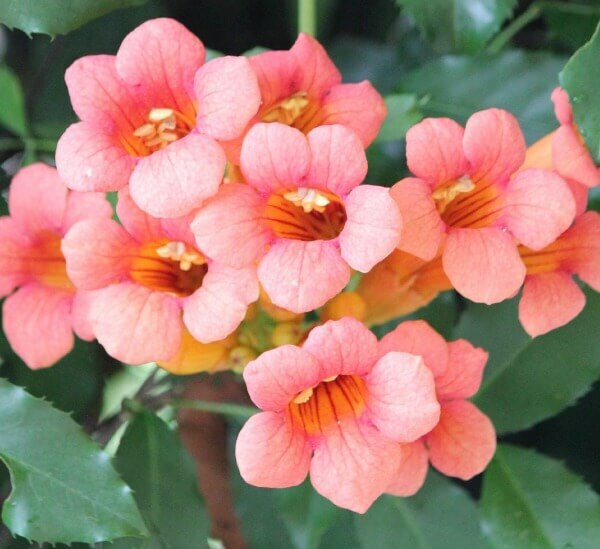 Trumpet vine. They come in different colors. Wow! 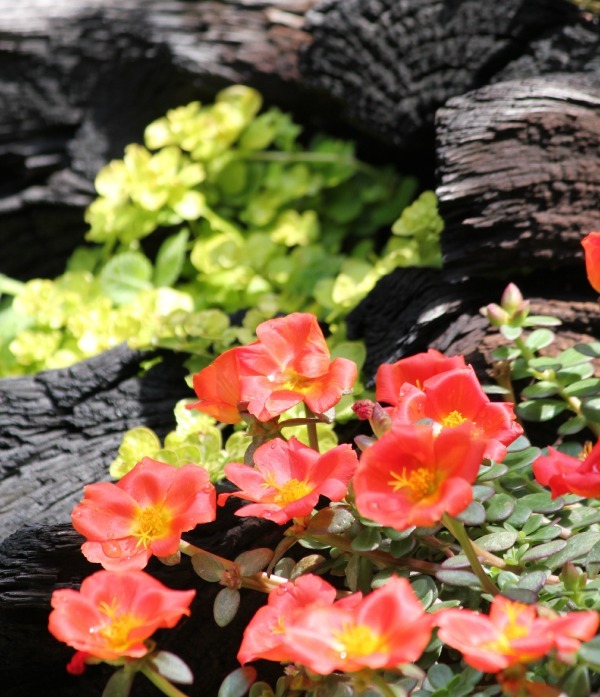 Your garden is like an artist's pallet! What a visual delight! I have good luck with many things in containers, but for the life of me, I can't get white cone flower to survive. We are in a severe draught period, which is unusual for the Pacific NW. 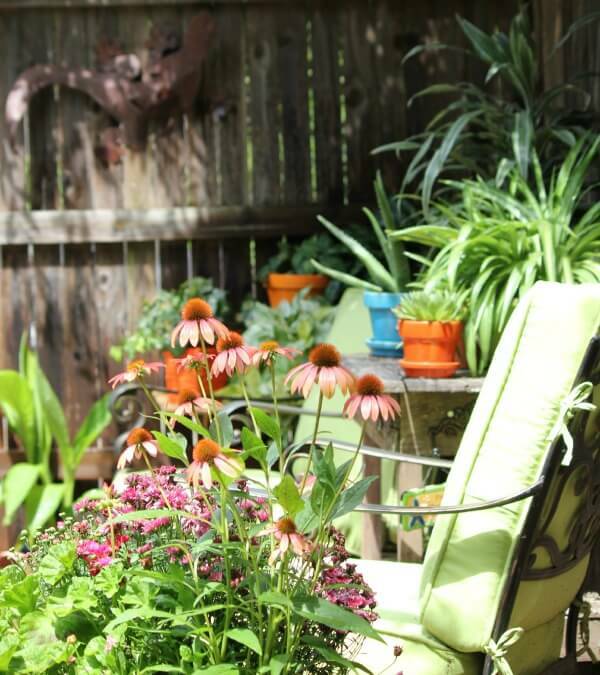 You are a savvy gardener, with a green thumb! I miss my garden and even though I've made the best of this small balcony- it's not so great. But my plants are alive, a few blossoms. Being way up here on the 3 rd floor with a windy Southern exposure dries them out quickly. So I haul out huge buckets of water daily from the kitchen sink to keep them going. Not a very modern approach, but a tried and true one! Here's to gardening in containers!